Use the form below to inquire about Nature Resort at Narayanpet . Use the form below to reserve for Nature Resort at Narayanpet . The Gyan, Otter and African cottages have private sit outs. The Rock Cottage which looks like a boulder has a private sit out and a terrace. The Turtle Cottage is 2 roomed and has a common sit out. 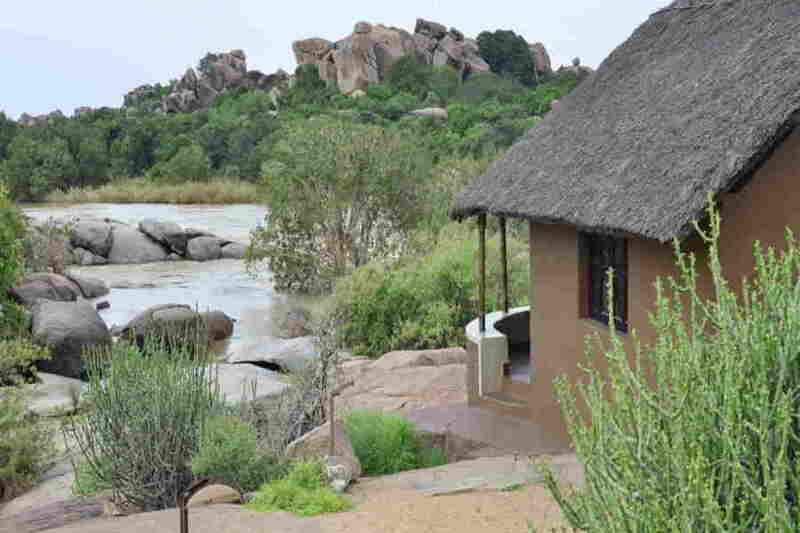 Sun cottage has 2 independent rooms with a common sit-out with a wide angle view of the breath-taking river. The Star Cottage is a spacious cottage with a very big balcony offering lovely views of the river. Break away from the interruptions of modern life at this Nature Resort at Narayanpet and savor the rich culture of Hampi. The rugged terrain surrounding this Nature Resort at Narayanpet is sure to leave you marveling about the effort involved in carving out an oasis of luxury and convenience amidst this harsh topography. The many water eroded boulders of varying sizes that dot the landscape and the Tungabhadra river that gently flows by before gushing down into a waterfall make for a picturesque setting. Situated just 7 km from Hampi by ferry, the property in Yamini Hills includes a bird sanctuary. The cottages in this Nature Resort at Narayanpet have been built to blend in with the many large boulders in the vicinity. Stone and wood have been used in plenty to create this resort. There is no access to television, telephones, or the internet at this eco-friendly resort. Dining at this resort is an experience in itself. The dining area has a thatched roof and offers views of the surrounding landscape including the rustic bird pond. You can use the help of the hand-painted bird portraits in the dining area to identify the ones you see live as you enjoy your meal. The food served here is South Indian style home cooked fare to delight both vegetarians and non-vegetarians. The produce is all sourced from the organic farm on the property. There are 16 rooms in all at this Nature Resort at Narayanpet. Each of the rooms is identified by unique and interesting names. All cottages come with spacious bedrooms and bathrooms as well as a balcony or sit out to enable you to enjoy the scenery in private. A few of the cottages come with two or more bedrooms and are suitable for large families or groups holidaying together. The perfect spot to enjoy a harmonious mix of natural and manmade wonders! This nature resort has a club house where you can enjoy a game of pool or table tennis. The mini gym is ideal for a quick workout session. There is a small bird sanctuary within the property and guides from the resort can accompany you there. You can also go on a guided trek to explore the majestic rock formations and the waterfall as well as the wooden bridges. Yet another walk trail passes through the organic vegetable garden, the mango grove, the turbine which generates power, and some ancient rock paintings. You can also choose to play some volleyball on the river bank, enjoy a barbecue and a bonfire, or catch the some splendid views of the sunset. The rock pool beckons you to take a refreshing dip. A short ferry ride from the resort lie the spectacular ruins of the erstwhile Vijayanagara Empire of Hampi. This UNESCO World Heritage site sprawls over acres of land and includes hundreds of monuments and temples. Hubbali Airport is the nearest at 170 km while Rajiv Gandhi International Airport, Hyderabad is around 360 km away. Kempegowda International Airport, Bangalore, is at a distance of about 379 km. Munirabad is the closest at 15 km while Hospet Junction is at 30 km. Bellary Junction is 90 km away while Bangalore railway station is at 352 km. Hampi is 38 km via SH49 and Huligi Gangavathi Road while Hospet is 30 km away via NH50 and SH130. Bellary is at 90 km along NH 67 while Bangalore is at 355 km on NH48.